On 25th October, just as a Shell-sponsored performance by the Sao Paolo Symphony Orchestra was about to start, a 15-strong choir suddenly stood up in their seats behind the stage, in full view of the audience, and began to sing. They launched into a version of the classic spiritual song Wade in the Water, with rewritten lyrics drawing attention to Shell’s controversial human rights and environmental record. 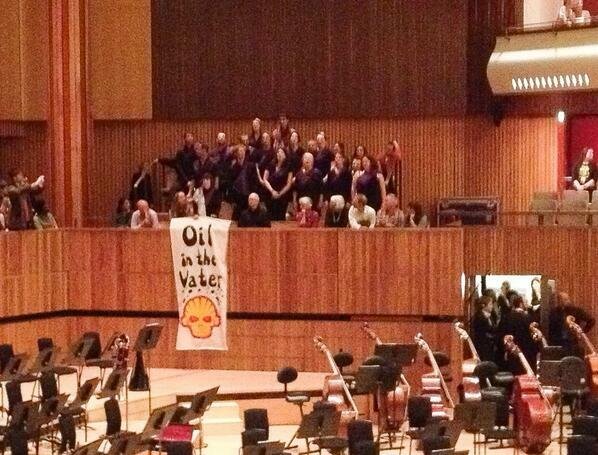 The audience listened and clapped along as the choir sang verses based on Shell’s polluting activities in the Niger Delta, the Canadian tar sands and the Arctic, and applauded as the singers unfurled a banner reading Oil in the Water and bearing an evil-looking Shell logo. There was further applause as the song ended, then the choir proceeded to the bar where they performed again before leaving the building. Security guards looked on but did not interfere. For the full story, see the Shell Out Sounds blog.